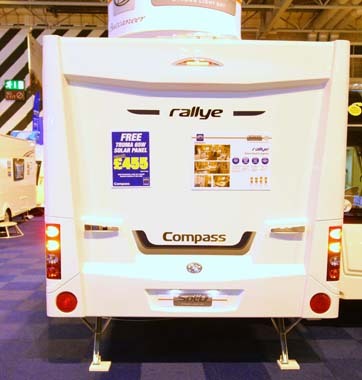 The Elddis Compass Rallye 554 is a new layout built on a single axle AL-KO chassis with a fixed transverse island bed. Stylish looking from the exterior and the interior with a panoramic Sky-Scape sunroof which, weather dependent, floods the living area with natural light or as I write this, with heavy grey clouds! It has a high gloss Smokey Quartz internal feature surround with LED lights, just in case of inclement weather and a pleated blind, useful day or night. 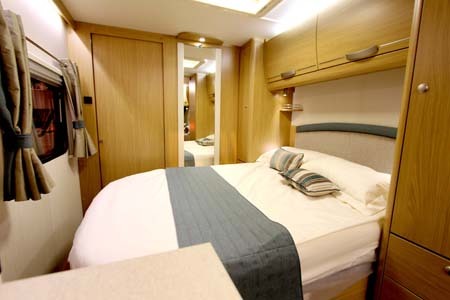 The parallel seating is in full light with a centre chest of drawers and four eye level lockers. The standard upholstery is called Cambridge, which was in the model we saw, and it had a lovely sheen, but there are two other options, and the curtains with a contrast border and tie-back were iridescent under the spotlights. The company calls the finish on the cabinets ‘Noce Prosecco’ a style used for a few seasons now, and the bamboo-effect vinyl flooring, its a dark chocolate colour, has drop in carpets. 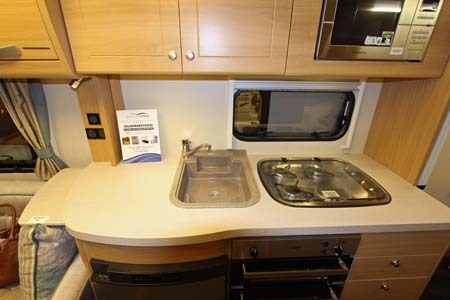 An unusual rectangular “Harvest” granite effect kitchen sink in the kitchen, gave the kitchen a “not the run of the mill” appearance and comes with a four burner hob, oven, grill and microwave. We noted the two deep drawers which we thought were very useful and practical both in terms of diameters and position. There were two conveniently placed mains power sockets and if you needed any more work top space, then there’s a handy pull up worktop extension. The island bed has a Coolmax memory foam mattress as standard and there is a curved and shapely padded headboard. There are wardrobes and drawers each side; they are obviously His and Hers and you’ll see why! The bed lifts up and there is a large storage area underneath which is also accessed from the exterior. 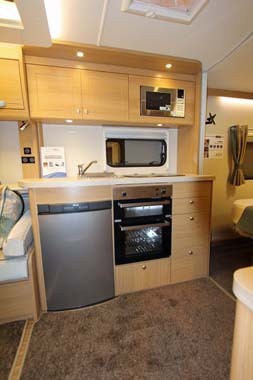 There is a convenient bracket and television point, two over bed lockers, so all in all it’s a practical area. Do you like the small shelves with rails on the bed head? 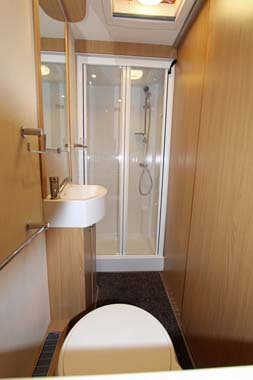 The shower room is usable without sustaining too many injuries to your elbows if you’re careful; on a single axle with an island bed, there have to be spatial compromises. The shower is square with a bi-fold door, and you’d need to stow your toiletries carefully. 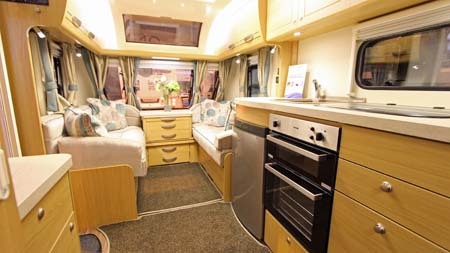 Green credentials are becoming a necessary, and welcome, consideration in caravan design and this caravan has 100% LED interior lighting and a large LED awning light. Heating and hot water is supplied by Alde 24-hr programmable central and water heating system with an LCD touch screen control panel. It also has mobile phone connectivity via the Phantom tracker, allowing remote access to the heating system. Verdict: the security package will be well received by your insurance company. Island beds have had a mixed reaction over the last few years but if designed with enough space around the bed and with a decent bed length is a desirable layout with many advantages over fixed nearside beds. ** Price is ex-works and includes VAT @ 20% but excludes a recommended retailer delivery charge of £495 including VAT which includes delivery to your dealer and preparing your caravan for collection by you. 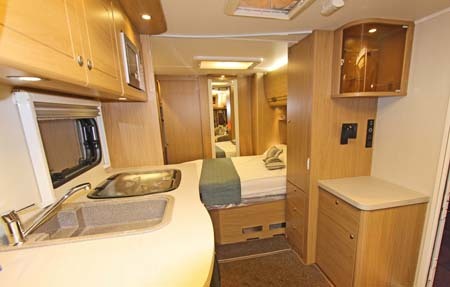 My wife and I would like to view the Compass Rallye 554 caravan and part exchange our twin axle Bailey Senator Wyoming series 6 as the van is rather heavy for me at my age (70) to handle. Could you please advise us of our nearest dealership? We live in Selsdon, Surrey with a post-code of CR2 8QE. Thank you. 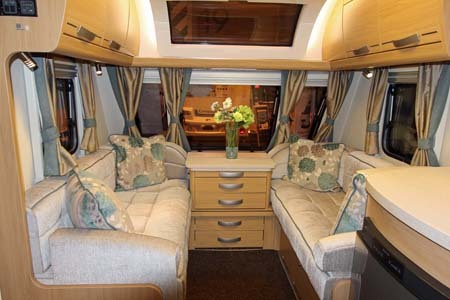 Of course, there’s a link on the Elddis website that allows you to search for a retailer/dealer. See here for details. 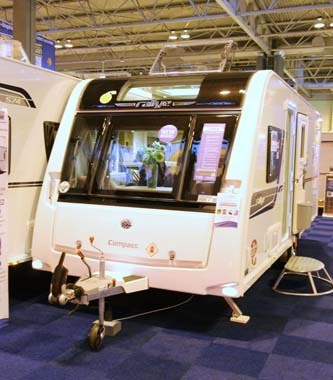 Chichester Caravans is coming up as your nearest Compass dealer, it’s just under an hours drive from your postcode.